If you’ve never tried sushi before or if you’re a vegan, this is the perfect roll for you. In fact, this is the basic for all American or Western sushi rolls. The California sushi roll was started it all in California (duh!) in an attempt to hide the seaweed from the presentation and ease the nit-pit eaters. It comes like a storm that swept through the Western culinary and even populate back into Japan too. This sushi roll is typically made of imitation crab (kani), avocado and strips of cucumber. It is then roll with rice on the outside, seaweed inside (uramaki) and cover with some sesame. There are a lot of variations for this roll, with each chef/restaurant changing it a bit. You could find this roll at any restaurant that serve sushi at a pretty cheap price too since the ingredients are all budget. Taste? It’s great, a combine of aromatic (w/ sesame), creamy (avocado), mildly sour and sweet (seasoned vinegar). The piece feels clean though, due to no fry, grill or whatsoever. This roll is so versatile, as you can serve it in house-on table, outside picnic, on the go… Since all ingredients are fully cooked, you don’t have to worry about eating raw meat/fishes. So yes, it’s kid safe. In fact, my little kiddo loves it so much that he would eat a whole 8-pieces roll any time we made this. Customization? Countless. There are just too many variations and adaptations of this roll. If you heard like the Texas, New Mexico, Las Vegas…and a bunch of other rolls w/ the city/state names, most of them are somewhat ingredients swapped of the California sushi roll. Interest in those variation, follow this list of popular American sushi roll. Since it’s so easy to make, I mean, almost no additional cooking required (you need to cook the rice though), just roll and go. There are so many ways to roll this: tradition bamboo rolling mat or simply just a kitchen towel. Got big hands? 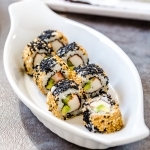 Try some of the maki rolls helpers and direction to make this maki roll. So let’s get down and make some roll for quick snack, ok.
Cut and slice cucumber into mini strips with each length equal to that of a kani piece. Fold the sheet of nori into half and tear to make two roll. Wrap you bamboo rolling mat with plastic wrap to avoid sticking. Place half sheet of nori over top, texture side up. Moist your fingers with water before and in between rolling. 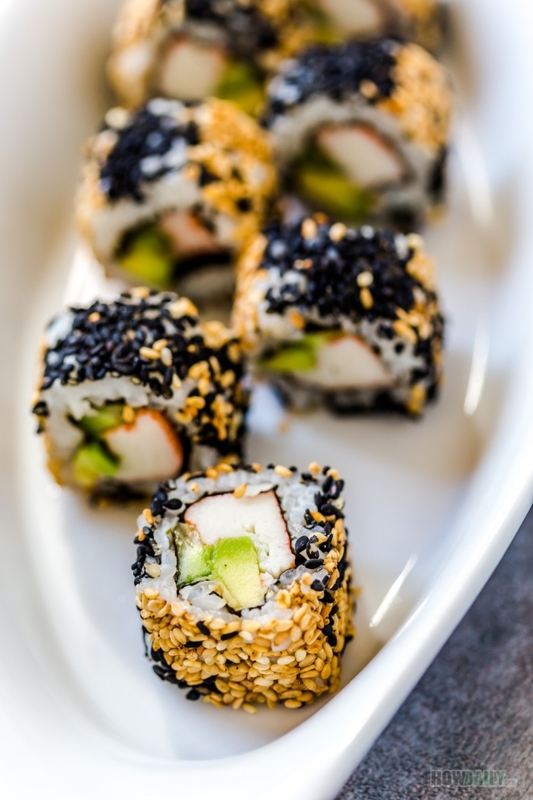 Spread 1 cup of sushi rice on top of nori, creating an even white rice layer leaving one end about 1/2 inch blank. Sprinkle or use a spoon to decorate this rice layer with white and black sesame. Substitute with masago or your desired of toppings if desired. Flip the rice/nori upside down with the blank nori end near you. 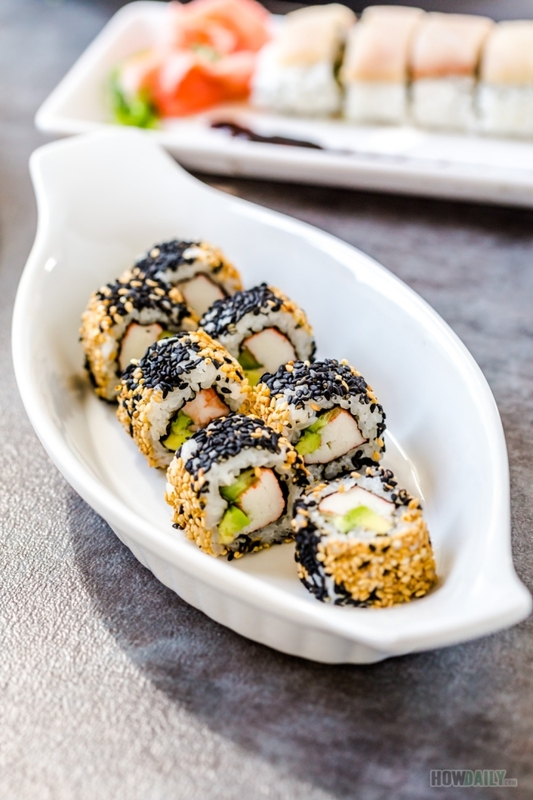 Arrange 2 kani pieces, 2 avocado slices, and a couple of cucumber strips onto nori. Hold, tuck and roll the nori over fillings ingredients. Pause and hold for a second to mold into shape before continue rolling to the end. Just gently press and hold to set the shape. Open the mat, and wrap the plastic wrap around the sushi roll, let sit for a minute or two before cutting.